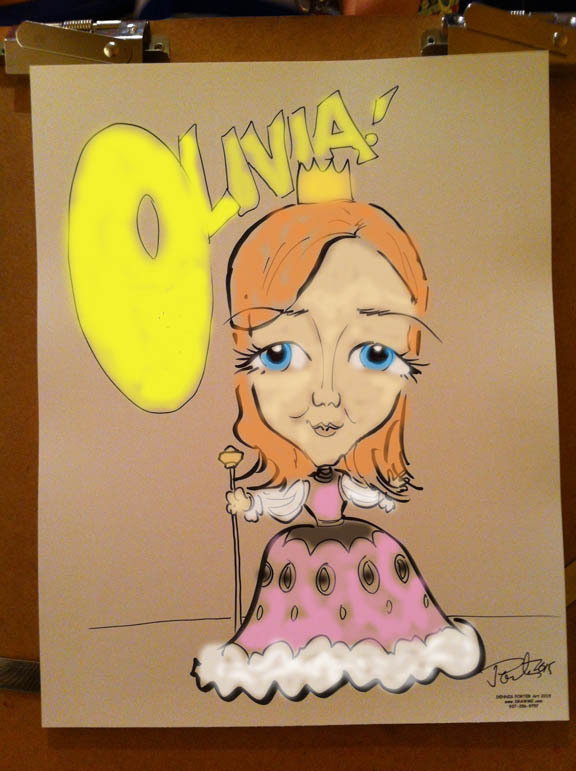 It is often a chore for parents, teachers and others to come up with fresh, different ideas to entertain children at parties. There are only so many things you can do, especially on the typical limited budget and time available. Kids are like anyone else — they appreciate something new and novel, an unusual and fun experience, right? Sure, of course. So what do ya do, anyhow?? Here is an idea that was a LONG time coming to me and to my knowledge it’s nothing anyone else is offering out there (please advise if you find out differently). While drawing at an outdoor picnic a long time ago with my old pal Tad Barney and another artist or two I was just about to close up shop, drawing one or two more at the end… when a little idea popped up. The other artists had stopped and Tad was watching my last sketch being made, a drawing of a young mother and her twin boys I believe. So that’s my big idea for you. 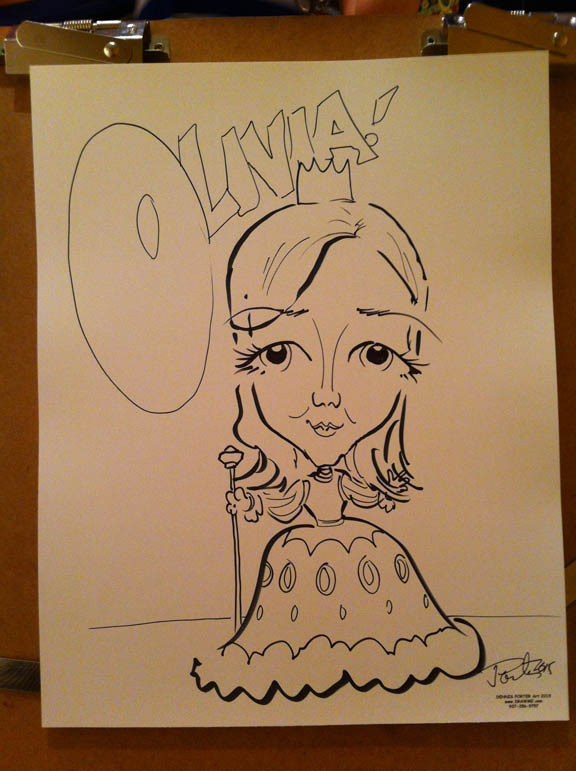 If the venue supports it, like an office setup or a home with a scanner (or even a good cell phone camera) and printer, make COPIES of your quick-sketch caricatures (assuming that’s okay with your artist at hand, as it obviously is with me) and have markers and crayons for the children to use. Do be advised that printer ink will smear with children’s water-based markers, so DRY media — like chalk and crayons — are best unless you have a commercial copy machine like a Xerox®. In any case, it will give the kiddies a bit of distraction at least for a while, eh? Maybe by then you can work up another hot new fun thing for them to do. 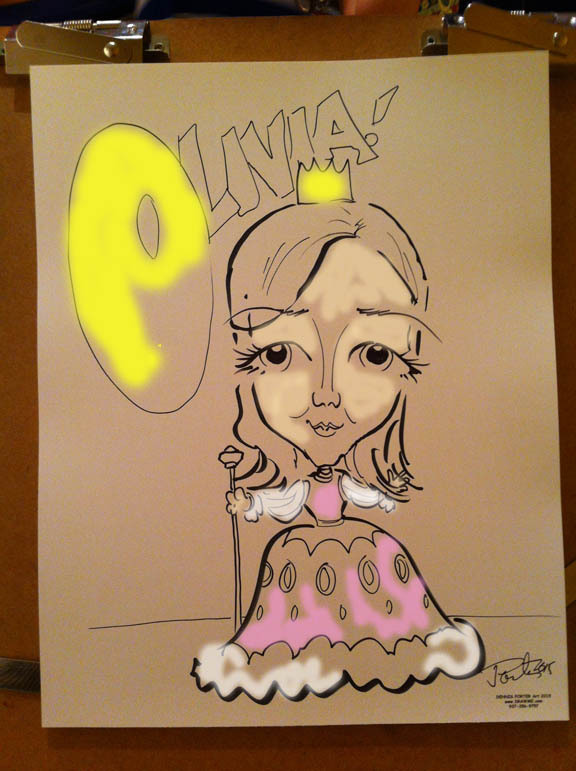 Princess caricature, color — fun for children!